We all know that Jesus is actually talking to disciples (and us as well) about their (our) fate after their (our) death. But what if Jesus was also talking about an imaginary place where he could come to us not only on special occasions but also when life gets to much for us and we begin breaking down? What if “the place” Jesus is preparing is here and now (or when we need it) in a place created in our own imagination? And what if Jesus could come and get us so we can be with Him if only for a few minutes? Jesus was a Master at creating imaginary scenarios such as “A sower went out to sow.” Or the Parable of the Prodigal Son. Or the Parable of the Good Samaritan. Or “The Kingdom of Heaven is like _______________.” I believe Jesus is still uses our imaginations to communicate with us. 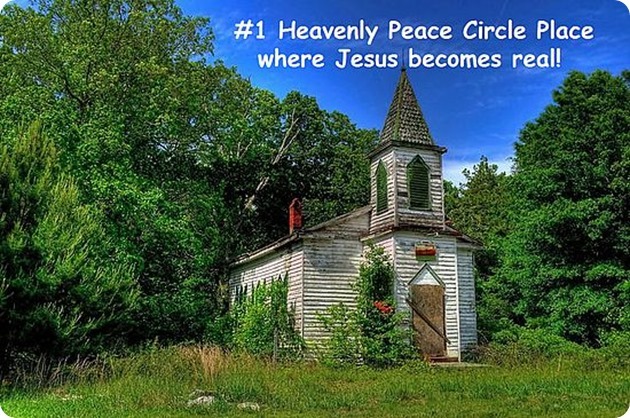 For me that “place” the two of us has created together in my imagination is pictured above, #1 Heavenly Peace Circle Place. It is an exclusive place reserved only for Jesus and Gary, it is a place where the two of us become real where the there are no “closet doors” and everything is laid bare for both of us to experience. I know I am asking you to stretch your imagination beyond where you may not want to go but it is absolutely necessary for us to experience Jesus not just in the bible or in a church but also in the privacy of our own life. The bible tells of Jesus wandering off into the mountains where He could be alone with God. If that was important to Jesus shouldn’t it be something important to us as well? I am sure if you listen close you will hear Jesus saying, “Come join me in your imagination I am waiting for you.” Don’t keep Him waiting!